Like any family with growing children, we have accumulated bicycles of all sizes while they have been growing. Some have been lovingly cared for and ridden daily, some left to languish in a corner of the garden gently rusting while their previous owners have grown up and out of riding a bike at all. Some have been sold, some given away and some have been left on the scrapheap of life. But one bike, one of our old, rusty, trusty, once-loved and abandoned bikes has become part of celebrations for the the famous Tour de France's Le Grand Depart which, for reasons I have yet to fathom, starts in Leeds in July. Leeds, Yorkshire. Leeds, noticeably not in France. Er.. Anyway, our old bike whilst not taking part in the actual Tour De France, to it's and all's relief, has become one of the pin-ups of the Le Grand Depart's accompanying Yorkshire Festival, a promised 100 days of art and culture set around and celebrating the Yorkshire leg of the Tour de France. The bike's current glamourous role is because I have the good fortune to know, and call a friend, yarn-stormer and crochet queen extraordinaire Cassandra Kilbride. 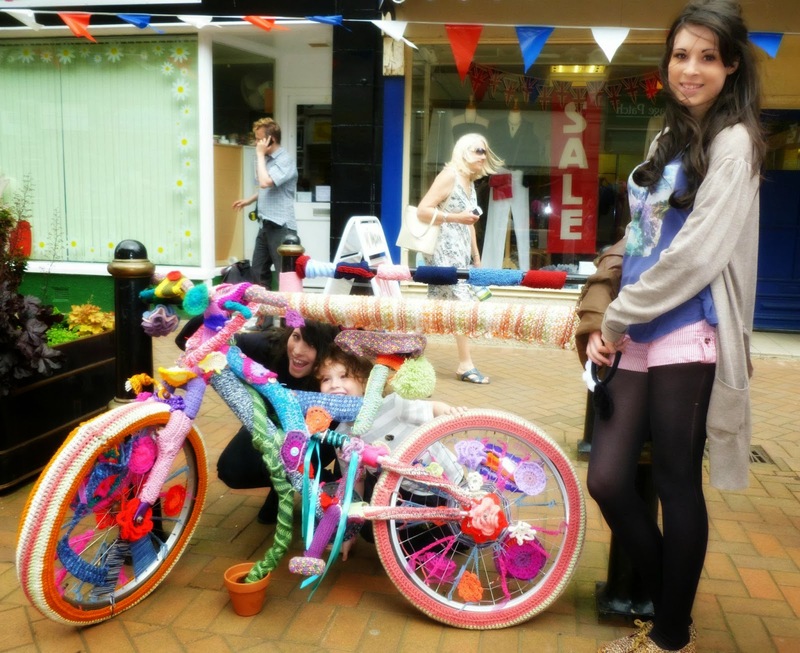 In 2012, as part of the community arts event Flock to Ossett, Cassandra wanted a bike to yarnstorm and I, gladly and gleefully, donated the old bike that neither of the TeenTwins would admit to leaving at the bottom of the garden. 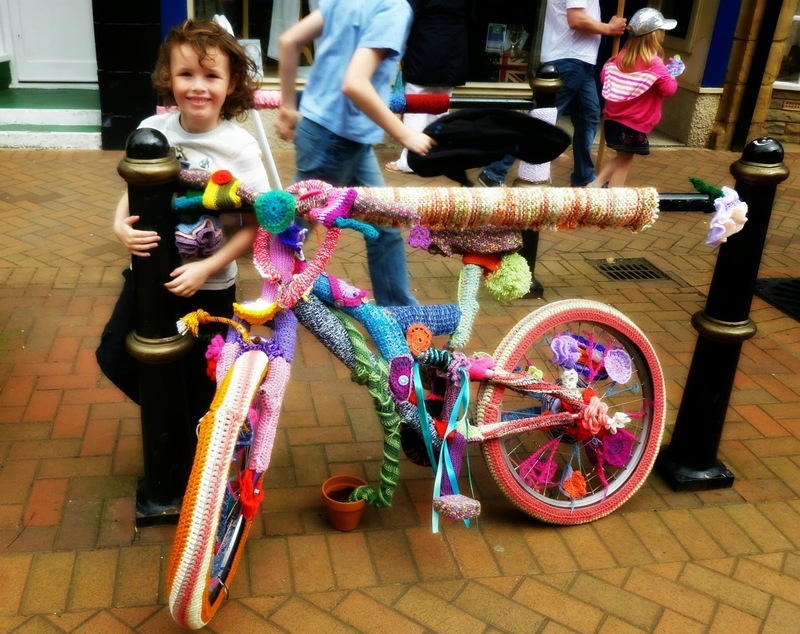 The bike became the centrepiece of the Flock to Ossett festival and we were, quite unjustly, proud to see it on display after it had been transformed by Cassandra and her dedicated band of volunteer knitters and crocheters. I had even managed to knit (when I'm not what you'd call a 'natural knitter' or, in fact, any good at knitting) a tiny part of the bike's woolly exterior. See the yellow and green bit on the handlebar, that's some of my knitting, that is. After it's success at Flock to Ossett, the bike became something of a local superstar and has been displayed and admired (apart from the yellow and green bit probably) near and far, including at the world famous Yorkshire Show. None of those bikes will be quite so beautiful as our rusty old bike from the bottom of the garden though. At least, not to us. Bicycle Girls .... and Boy. That bike is amazing - love the idea!